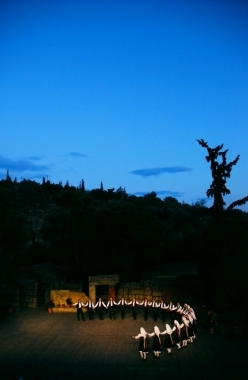 Founded over 60 years ago by Dora Stratou herself, nestled in a pine-covered hillside at the rear of Filopappou Hill opposite the Acropolis, The Greek Dances Theatre Dora Stratou provides a perfect setting for a summer evening’s entertainment in their enchanting open-air theatre built to resemble a village square such as you would find all over Greece. With a company of over 70 Dancers, Musicians and Singers and a wardrobe of over 2,000 original and authentic costumes, this is the closest you will get to Greek History and Culture of yesteryear. Indeed many of the dances and steps can be seen on Greek vases and plates in museums all around Greece proving that they are indeed a living link to antiquity. The dances are taken from all over the Greek Peninsular and beyond. From the Sunny Greek Islands to the mountainous North of Greece, from the diverse cultures of the Peloponnese in the West to the fiery dances of the Black Sea and Asia Minor. All are ethnically correct, having been handed down through the company from dancer to dancer over the years. Watch the beautiful ladies seemingly glide across the stage their feet hardly moving, and watch the men in their traditional Foustanella perform leaps and acrobatic feats to impress the ladies. Admire the intricacy of the beautiful costumes, all hand made and embroidered, some with gold and silver thread, and all accompanied by authentic jewellery and accessories, such as you will not see anywhere else in Greece. During the winter classes in Greek Folk Dancing take place every evening in our bespoke studio below the theatre and lectures and demonstrations on various aspects of modern and ancient Greek Dancing take place in our HQ at the House of Dance in Plaka.